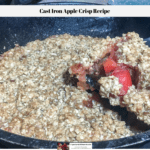 This cast iron apple crisp recipe is a delicious dessert that is quick and easy to make. Plus since it is made in a cast iron skillet, clean up is easy! Put 2 Tablespoons butter in a large cast iron skillet and turn the heat to medium. Drain the apples, unless you are using pre-made pie filling. One the butter is melted, add the apples or the pre-made pie filling. Cook the apples or premade pie filling for three minutes. Add the light brown sugar, cornstarch and vanilla paste to the top of the apples and stir to combine. Turn the heat off, but leave the skillet on the burner. Combine all the ingredients for the topping in a large bowl. Use a fork to mix the butter into the dry ingredients. Once the butter is well incorporated into the dry ingredients, spread the mixture on top of the apple mixture making sure it is evenly spread out. Cover the cast iron skillet with a piece of aluminum foil. Place the cast iron skillet into the oven and turn the temperature to 350 degrees Fahrenheit. Once the oven is preheated, set the timer to 15 minutes. When the 15 minutes is up, remove the aluminum foil and set the timer to 20 minutes. When the timer goes off, check the top of the apple crisp to see if the oatmeal is browned, if not, bake the apple crisp for an additional 10 minutes. Once the oatmeal topping is slightly brown, remove the cast iron skillet from the oven and let it cool for ten minutes. *You can use two cans apple pie filling instead of the two pints of apples if you prefer.